For tractor models 200, 200B, 210, 210B, 211, 211B, 300, 300B, 310, 310B, 311, 311B, 312, 312B, 400B, 410B, 411B, 420B, 500B, 510B, 511B all with vertical exhaust. 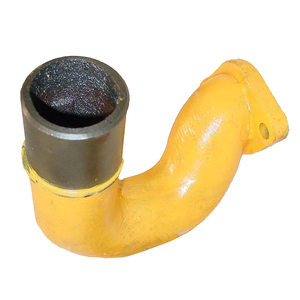 This elbow has a 1-15/16" outside diameter pipe outlet and 3.00" center to center bolt holes. Order Gasket 1349111C1 separately. Replaces original part numbers G1727 and G2022. New, aftermarket Exhaust Elbow for sale with a solid manufacturer warranty. In addition, we have a generous 30-day return policy if this Case Exhaust Elbow for Case 200, 200B, 210, 210B, 211, 211B, 300, 300B, 310, 310B, 311, 311B, 312, 312B, 400B, 410B, 411B, 420B, 500B, 510B, 511B tractors needs to be returned for any reason. Please see our Parts Warranty and Return Policy links on your left for complete details before returning.